Prunes are very rich in sugar, carbohydrates, fiber and minerals. It's worth remarking that this fruit is unparalleled in its excellent nutritional values, as well as its natural intestinal regulation properties. You can find whole (with pits) and pitted prunes (without pits). The intake of prunes Chile origin is increasing every year due to its quality, regularity and to be good value for money that allow Chile to gain share in our market against California. The usual calibers are 30/40, 40/50, 50/60 and 60/70, regular and pitted. Packed in 5 and 10 Kg. cartons. Did you know that it takes about 4 and a half pounds of grapes to yield 1 pound of raisins? 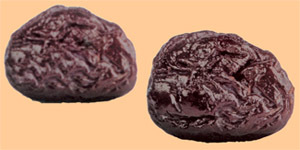 The growing and harvesting of raisins requires a strong effort and is one of the most labor intensive in agriculture. Used in cereals and bakery products, raisins are prized for their rich, raisiny flavor, sweetness and their uniform color which adds eye appeal to many products. Varieties ranging from standard Thompson to Muscat or Zante Currant. The standard Thompson variety grades in three sizes: Selects/Bakery, Midgets and Minies, containing 1000/1200, 2000/2500 and 2600/3000 berries per lb. respectively. Like prunes, its consumption is growing in Spain for the good quality and to be also good value for money.